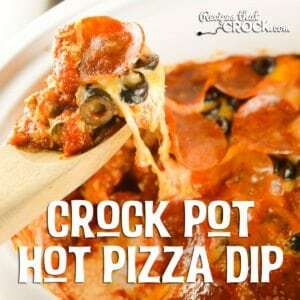 Crock Pot Hot Pizza Dip - Recipes That Crock! Enjoy all the fun of pizza night in a yummy slow cooker party dip recipe– Crock Pot Hot Pizza Dip! This dip is completely customizable for all your pizza preferences. This recipe calls for pepperoni, onion and olives but much like pizza, feel free to substitute your favorite pizza toppings. Try alternative versions like Hawaiian (pineapple and ham) or BBQ Chicken and Bacon. We used a mini casserole crock pot, but you can use any small slow cooker. We served this with Ritz Crackers but it would also be good with pita chips or even breadsticks. All the fun of pizza night in this yummy Crock Pot Hot Pizza Dip! 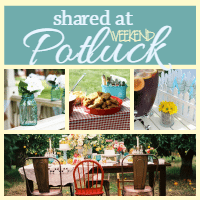 Would you like to check out our other party perfect recipes? Check out our Appetizers & Dips section. Hi! 2 questions: how do you recommend taking this out of the crockpot for serving in a nicer looking tray? Or, if that’s not likely, could you recommend timing for baking this in a clear casserole dish and temperature in the oven? My bookclub is going to love this!